Anthony Joshua says he did not feel like a genuine heavyweight world champion before April's victory over Wladimir Klitschko. The 28-year-old Briton - who faces Carlos Takam in Cardiff on Saturday - won the IBF title in 2016 but stopped Klitschko after 11 rounds at Wembley Stadium to add the WBA crown. "I became a champion because of what I went through with Klitschko," he said. "Those type of fights have championship status written all over them." Quiz - Which heavyweight great are you? After beating Charles Martin in two rounds to land the IBF crown in just his 16th professional fight, Joshua was uneasy at being referred to as "champ". Asked by BBC Sport's Mike Costello if he now feels like a champion, Joshua replied: "Now I do. Not in a big-time way. Even though I trained for Charles Martin, the fight looked too easy. "What we went through with Klitschko represents what a champion is. "Rob McCracken has never trained me to take a battering. But in that ring, in a time like that, there is nowhere to hide. It comes down to who you are at that moment." Could you match Anthony Joshua's workout routine? McCracken has been applying tweaks to the game plan to face Takam, who stepped in to replace the injured Kubrat Pulev less than two weeks before the Principality Stadium fight. 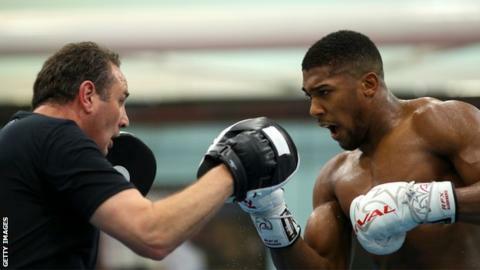 The 49-year-old coach has seen a difference in his fighter since the enthralling win over Klitschko, pointing to the fact Joshua wanted to train between fights rather than take too long off. "He respects professional boxing even more now," McCracken told BBC Radio 5 live's boxing podcast. "He did before the Klitschko fight but even more now. He knows how tough and dangerous it is at the top level. "He has ticked over in between the fights, going for runs or coming in the gym. "He didn't do that after defending his title against Molina. So he's showed he learned a lesson and showed he is deadly serious about improving, even though he has the heavyweight championship." Cameroon-born Takam, 36, is around five inches shorter than the 6ft 6in unbeaten champion and has never challenged for a recognised world title in a 39-fight career which contains three defeats. The fighters will perform public workouts in Cardiff city centre on Wednesday evening. They will weigh in on Friday lunchtime and Joshua is expected to be considerably lighter than the 250lbs he scaled before facing Klitschko. BBC Radio 5 live boxing analyst Steve Bunce: "I think Takam will be in good nick. I think Takam is a tricky opponent and a pain in the backside for three or four rounds. That's Takam's fight, three or four rounds and after that Joshua could make it easy." BBC Sport boxing correspondent Mike Costello: "I think the key here will be Takam's mindset. He has had a fortnight to get his head around it. Maybe that short timeframe is a boost for a boxer as he hasn't drained himself by thinking about it for months."